As of about 2:00 this afternoon, our little family is officially "home" for Christmas, in the town where Bryan and I grew up and met and were married, and where all three of us, by a twist of fate, were born. I can't tell you how thrilled I am to be here, and how much I've been looking forward to this day since... oh, the first of November or so. The hardest Christmas so far was last year. Camilla was a high-maintenance infant, and although we were totally in love with her and well aware of what a blessing she was, we were foremost simply trying to survive. 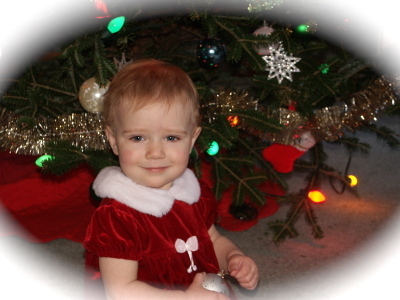 I did not have post-partum depression, but I feel depressed in retrospect remembering what we went through a year ago. Mostly, though, I'm just glad that it's not last year now: it's NOW. And Now is just really freaking awesome. All my siblings are home, which is something that happens only about twice a year since Maggie is in college and George is in the Coast Guard. Plus my mom's brother and his wife are here for Christmas, which is unprecedented. They're about as fun as an aunt and uncle can be, and having them around is going to bump the awesomeness quotient up another notch. PLUS I know about a bunch of great presents that people in my family are receiving (including my own husband) (shhhh), and nothing makes me happier than the prospect of other people getting great surprises. When we were kids our family didn't "do" Santa, and I never felt deprived by it at all. Christmas was a lovely time for us. 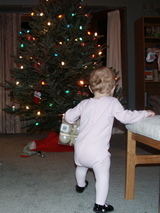 Other kids were very interested in their "loot" (as Calvin always calls it) but I never was, and as I got older I attributed it to the fact that we didn't do Santa, and our Christmases weren't stuff-centered. That might have played a part, but I realized not that long ago that my own temperament is the real reason I wasn't too concerned about what I got for Christmas. Now that I'm on the subject of temperaments I'm reminded that I recently took another quiz on the whole Keirsey/Myers-Briggs temperament topic. (There are about a million places to take the Keirsey or Myers-Briggs tests online.) I love quizzes, and take them obsessively, and this one reaffirmed that I'm an ENFJ. (Extraverted Intuitive Feeling Judging - I'm very strongly NFJ, and mildly E.) I know that these things can be taken with a grain of salt on many levels, but I'm always surprised how much the given profiles fit me. I'm curious if you all know your temperament types, and what they are. I sometimes wonder if particular personality types are more likely to be the kind of people who read blogs and live a part of their lives on the Internet. I'm thinking so. I'd be surprised to find that the breakdown of bloggers and blog readers matches the personality-type percentage breakdown of the general population. I kinda want to do a mini sampling in my own comments section. Hey, if you all oblige, it could be like your Christmas present to me! It makes my head hurt just to think about it, but there have been years when I started my Christmas shopping on December 20th. Granted, those were days when I was a college student and generally had finals until the 19th, plus I was childless and did not have an enormous sleep debt, and I had plenty of time and energy to tool around the mall until I found acceptable gifts for everyone on my list. Then last year we had the world's (or at least the neighborhood's) squalling-est child, and the mall was out of the question. We had no desire to stress ourselves to insanity by dragging the baby there, and neither did either of us want to stay home in the evenings to deal with Her Royal Fussiness alone while the other person used valuable hours that could have been used for sleeping trawling the mall alone. Ergo, we determined that we would start early and order everything online, which we did, and all our presents were wrapped and under the tree by December 14th. And we became hard-core converts to online shopping. If you're walking around a mall and suddenly think of a gift idea, you've got to drag yourself to different stores looking for it, and chances are you won't get the exact style, color, or size you want. On the Internet, however, you can! You can get everything on the enormous Internet, and if you're smart about it you can usually avoid paying shipping, and the lovely UPS or USPS man brings it right to your door, which is awesome. And rather than spending hours on your feet fighting crowds and sweatily wishing you'd left your coat in the car, you can do all your shopping from the comfort of your couch! To me, that last part is unbeatable. I do actually like the mall at Advent time (what the rest of the world knows as Christmas time, but it's really pre-Christmas and I hate the mall during real Christmas time because all you see are Valentine's decorations and it's depressing) when I don't have an imperative to find a gift for someone. I've been there twice recently because my sister had some buying/returning/buying to do, and the place is bustling and the lights are twinkling and the pseudo-carols are playing and it makes me feel happy. Plus, we've recently realized that Daniel and Camilla are old enough to play in the area with the big plastic figures and the children running around like crazily and they love it, so now mall trips are not just an hour of zipping around trying to get errands done before the agitation to "get me out of the stroller now, please" reaches critical-mass levels; they're an hour of that, interrupted by half an hour of relaxing while our children become socialized. Speaking of children's play areas reminds me: I read in a magazine article today that the "five-second rule" (??? - I always thought it was the "ten-second rule") when food drops on the floor is Dangerous, and that food and utensils that touch the floor should be immediately discarded or sanitized. I'll save the rant about the hyper-risk-averseness craze for another time, but I just have to say: what the heck? The article wasn't talking about public places, either - it was saying that you shouldn't eat or use things that have touched the floor *in your own home,* because "studies" show that they can pick up salmonella or E. coli from the floor instantly. My baby is on my kitchen floor all the time. She walks on it, she crawls on it, she sits on it, she even lies down on it. And while I don't actually serve her meals on the floor, if she drops her breakfast Cheerios off her high-chair tray, sometimes I just leave them down there for her to snack on throughout the day. But! I find it hard to believe that large amounts of salmonella and/or E. coli are congregating on the linoleum. It's not like I'm cutting up raw chickens down there, or doing whatever you do to get E. coli on things (changing diapers? handling raw sewage?). If I do happen to drip chicken juice while I'm cooking, I clean it up immediately, because of the above-mentioned baby. Am I a careless messy person who's threatening the lives of her family by not being careful enough about food cleanliness? Maybe I just haven't known it all this time? I hope all of you have your Christmas shopping done! I feel stressed for your sake if you don't. Although you can feel stressed for my sake, because we don't have our Christmas cards (86 of them) sent out yet because the photos that are supposed to go in them have not yet arrived, and can I mention how much I hate Apple's photo service? You can all have a preview of the picture as a reward for making it all the way to the bottom of this ramble. It's no secret that my second favorite of the world's very small persons is my nephew Daniel. He's eighteen months, which is a great age, and I have so. much. fun. with the kid. Milla is a thing of beauty and a joy forever, but facts are facts, and the fact in this case is that a fourteen-month-old simply does not have as much cunning and humor and sense of comedic timing as an eighteen-month-old has. Milla delights us by playing peek-a-boo and by responding, "Baa" when we ask her what a sheep says. Daniel makes us pray for better bladder control when we glance over at him during lunch to discover that he has calmly and deliberately stuck a straw up his nose, and is snorting through it happily. 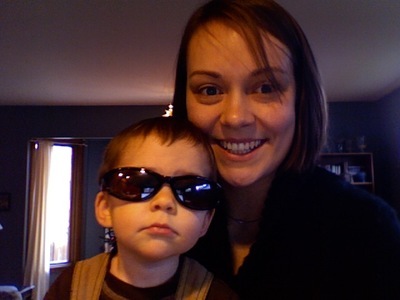 Milla likes to play with my sunglasses, but Daniel likes to wear them. He knows that he is a Cool Guy. Sometimes his sense of humor is problematic, such as when my sister is trying to discipline him when I'm around. She'll be speaking sternly to him and he'll catch a glimpse of me over her shoulder and shoot me a sneaky little "you and I know what's up, Aunt Arwen" grin, and I'll clap my hand over my mouth but he's not fooled by my attempts to disguise my laughter, and my poor sister's stern words are undermined. To me, though - since I don't have the job of disciplining him - Daniel is pretty much pure joy. I love the way he runs, the way he yells, the way he dumps our little toy box so delightedly, the way he generously tries to feed his cousin, even the way he continually unplugs our Christmas tree lights. I'd feel like something vital was missing if I didn't have this kid around. I do sometimes remember with nostalgia the days when his tiny eight-pound self would sleep peacefully curled up on my chest, but the fun of eighteen months totally makes up for it. 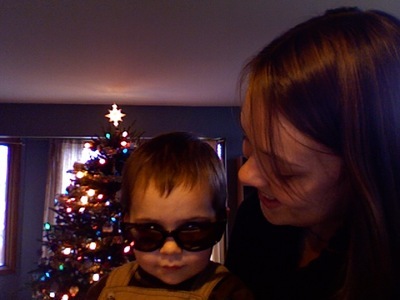 Besides, come July I'll be able to hold another tiny niece or nephew, while still enjoying toddler Daniel. Can't beat that. From: Stump the Parents, Inc.
We at Stump the Parents would like to thank you for signing up to be a member of Operation Stump the Parents Worldwide: 1-Year-Old Contingent. While we at the 1YOC cannot hope to induce the Parental Stumpage Levels (PSL) achieved by members of the teenaged contingents of our task force, it is our hope that OStPW:1YOC will soon be achieving PSLs among the parents of 1-year-olds that rival the levels achieved by our 2- and 3-year-old contingents. It's an ambitious goal, Camilla, but with the help of dedicated citizens like you, we believe we can get there. It is with this end in mind that we have, per our agreement, been observing your interactions with your Assigned Parental Units (ASU) in your home over the past few weeks. Based on our observations, we have created a personalized list of suggestions for upping the PSL in your home. It is our experience that when used by 1-year-olds, our personalized suggestions are 97% effective at raising the PSL in the homes in question. Furthermore, in 29% of cases, the PSLs achieved by these 1-year-olds is equal to or greater than the PSLs achieved by the average 2- or 3-year-old. As you can see, Camilla, it is imperative that you implement our suggestions as quickly as possible. If you need clarification or have any questions regarding your personalized suggestion list, please call our 24-hr hotline at 1-888-STUMPED, and one of our implementation consultants will be happy to assist you. We thank you for your help, Camilla. Thanks to you and others like you, PSLs all over the world are on the rise. Your continued support is much appreciated. 1. Assigned Parental Units do not want their children to be unhappy or in pain, but on the other hand there are some things they just have to do. Take advantage of this. When the ASU is in a position where he or she must finish the current task, start screaming unhappily. Then - and this is the key part - on some random occasions, do not calm down until the ASU can comfort you. On other random occasions where the circumstances are exactly the same, calm down before the ASU has a chance to comfort you. This will confuse the ASU and make him or her wonder if it is actually necessary to offer comfort. Keep the ASUs guessing, and the household PSL will skyrocket. Our observers noticed that you've already been implementing this tactic to some extent during diaper changes, which is excellent. Keep up the good work, and continue to broaden your range. 2. Although the behavior is most commonly associated with older toddlers and preschoolers, one year old is not too young to start acting weird about food. Our observation committee saw an incident recently where you refused to take bites of your female ASU's breakfast egg when she offered it to you, but then eagerly grabbed and devoured a piece of egg that she dropped on her pants. This is an ingenious tactic which we recommend you employ as often as possible. Our team also recommends: a) refusing to eat when your ASUs are watching you but then chowing down when they are not looking, b) changing from day-to-day the foods you consider acceptable, and c) asking for more food when your mouth is already full. Unfortunately our team has observed that your ASUs have a low anxiety level and are unlikely to become worried about your eating habits as long as you remain healthy; this is bad news because anxiety is an excellent compounding factor for PSL. However, it is still possible to make your ASUs feel that their heads are going to explode. This is also very good for PSL, so stay on track with food weirdness. You're off to a good start. 3. Our surveys of ASUs show that a hot-button issue in their demographic is how well their children do (or do not) sleep. Bad sleep, not surprisingly, helps raise PSL. You personally, Camilla, have been an overachiever in this area, and we at OStPW:1YOC applaud you for that. We also realize that after nearly fourteen months of waking up multiple times a night, you might be starting to get worn out and want to sleep for longer stretches. This is fine, but because a well-sleeping child has been shown to significantly lower a household's PSL, it is imperative that you take counteractive measures. We suggest that after sleeping well for several nights in a row, you try mixing it up a bit. Wake up two or three times just for the fun of it. Make sure to do this when your parents have not changed any factor of the sleeping situation, so they will not feel impelled to take action, but will instead wallow in confusion and despair. Confusion and despair are both excellent for increasing PSL. Our observers did notice that you are managing to keep your sleeping-straight stretches to under seven hours a night. This is impressive, and you are to be commended. Many one-year-olds do not have your tenacity. Camilla, we hope that these suggestions will be a good jumping-off point for your work as a member of OStPW:1YOC. As you become more experienced and advance through the ranks of the 1YOC, we will continue to provide you with personalized suggestion lists that will increase in difficulty as you increase in skill. In the meantime, keep up the good work! OStPW:1YOC is glad to have you on our team.